Dr. Steve Jacobs, Optometrist, has extensive experience in the pre-operative evaluation and post-operative care of LASIK and other vision correction procedures. Although both nearsighted and farsighted people can benefit from the LASIK procedure, it can correct a much greater refractive error, and is more stable and precise in cases of nearsightedness than farsightedness. With nearsighted people, the goal is to flatten the too-steep cornea; with farsighted people, a steeper cornea is desired. 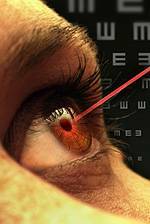 Excimer lasers also can correct astigmatism by smoothing an irregular cornea into a more normal shape.